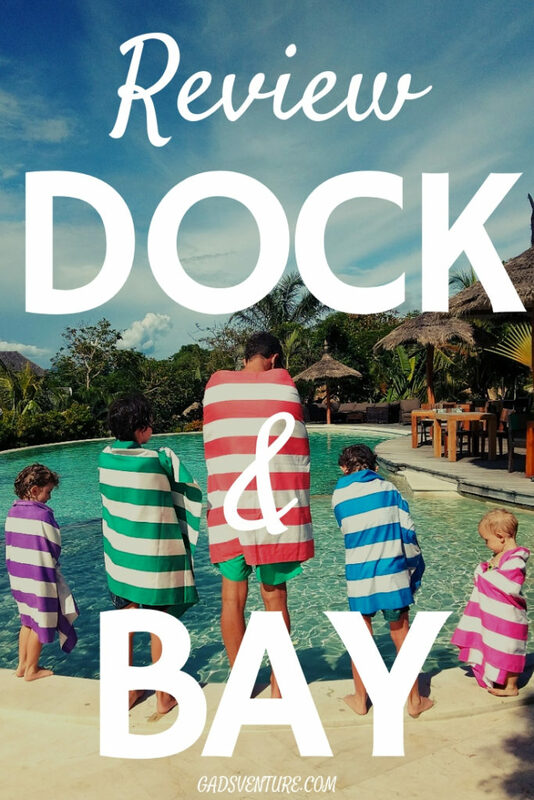 These gorgeous Dock and Bay compact travel towels have been so handy on our gap year with our 4 kids. 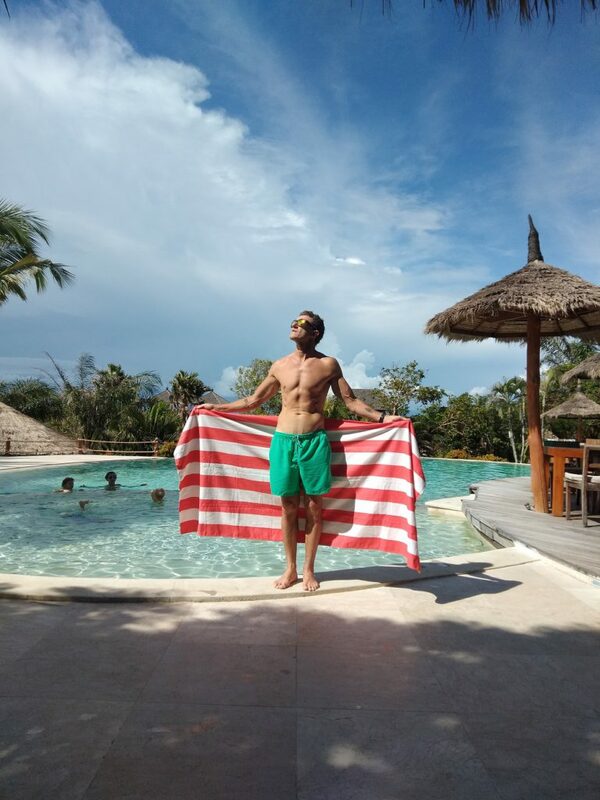 Soon we will be putting them to the test against other popular brands of compact, quick dry travel towels and bring you “the world’s best travel towel!”. I was super impressed when we received our samples from Dock and Bay for testing and review. These guys were a really nice company to deal with, and the postage was very fast to regional Australia. The 6 towels arrived in their individual packets, wrapped in biodegradable plastic packets. The beautiful and distinctive brightly coloured stripes are definitely an attention grabber! Lined up, our family look so striking with our collection! 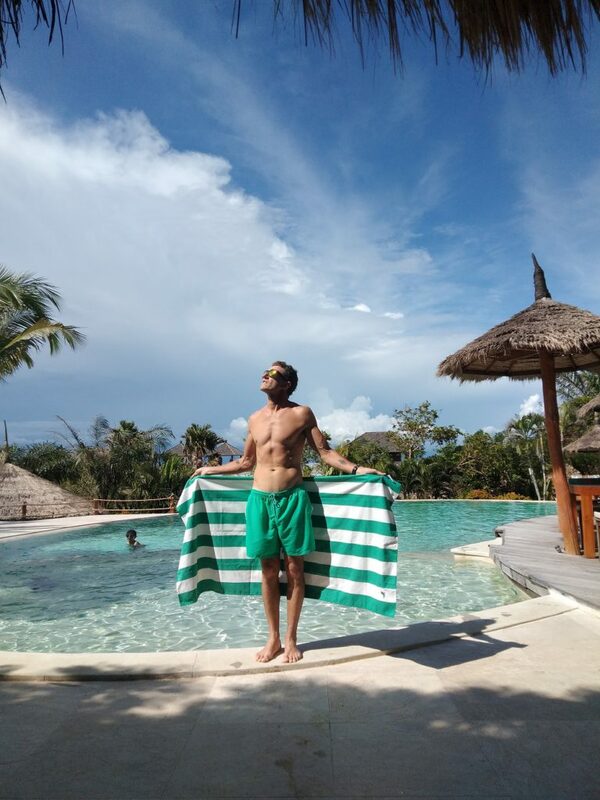 Weights are very important when choosing a compact travel towel, and these ones take the cake! They pack down into the size of a small novel. The individual carry case that comes with each towel is made out of a heavier canvas fabric with a mesh side for breathability and I guess this is designed for containing wet towels inside a bag. I ended up ditching the bags, as they cumulatively gave us too much extra weight, with 6 towels at 50 g each. 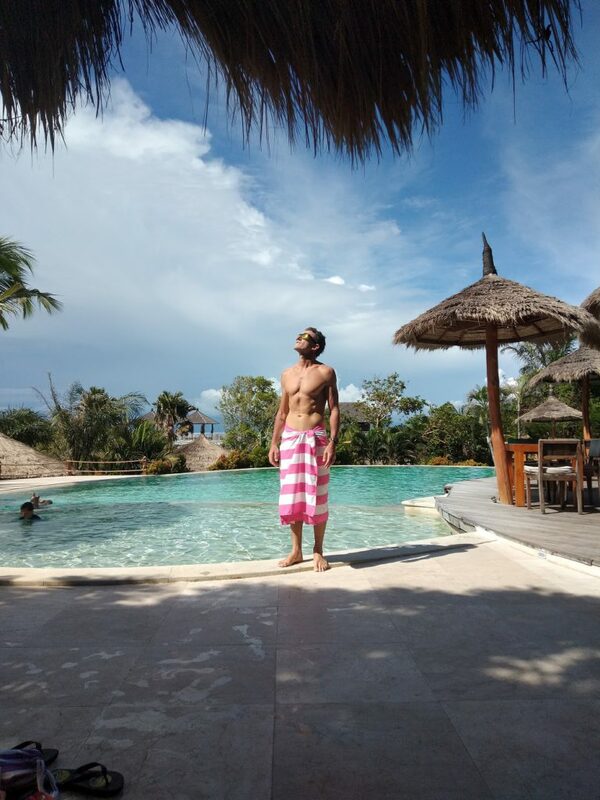 Dock and Bay towels are made out of a 220gsm smooth microfiber (80% polyester, 20% polyamide) and are so soft to the touch. After a month of continuous use, the stunning bright colours have not faded at all. They are very easy to wash, with no special conditions at all, which makes me very happy indeed! 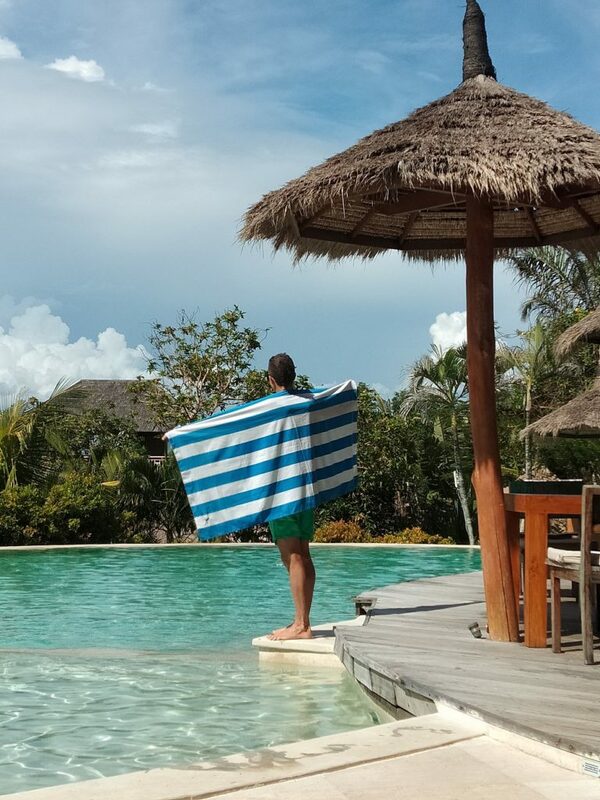 Dock and Bay towels are so easy to grab and throw into your bag for a morning at the beach. They are very comfortable to sit on, but are quite thin which can be a good thing and a bad thing together. The thinness means they dry very fast, and are incredibly compact but the flip side of this is that they do lack some absorbency when compared to other bulkier travel towels. They are super light weight and versatile too and we often use one for an extra blanket for the kids if the air conditioner is too cold, and they also come on our plane trips. Sand definitely does not stick to these beauties, not even when you sit on a towel, on the beach with a wet bum. No wet bum print of sticky sand. It falls straight off. Like magic! Remember old fashioned cotton loop towels? Never again will I waste my money on those. Not when these innovative people have absolutely revolutionised beach towels at Dock and Bay. The designs are simple and effective variations of bold stripes against a white background, or you can get plain solid colours as well. The newest colours have just been released under the super cute ‘Fruity Collection”. 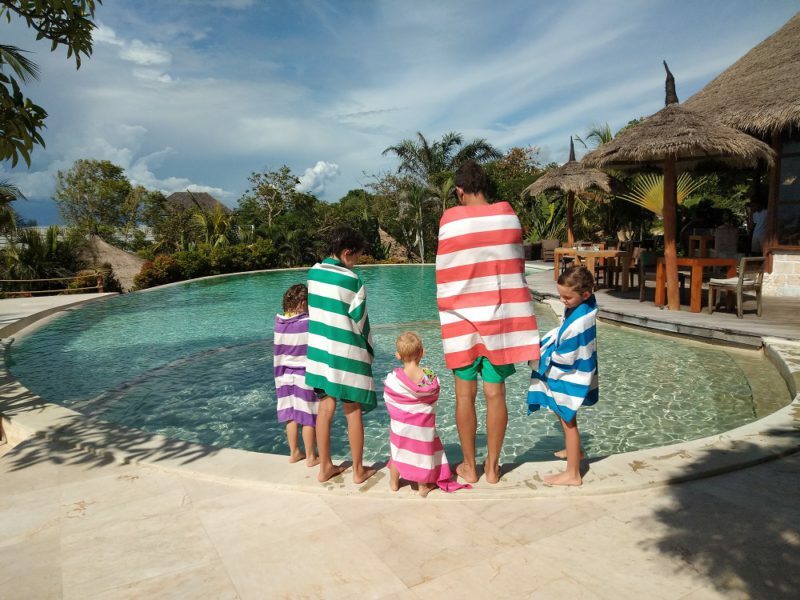 We have a classic collection of Dock and Bay towels, Bondi Blue, Cancun Green, Ipanema Orange, Phi Phi Pink, Brighton Purple and Waikiki Orange. You can also grab these in solid colours as well. Also available from Dock and Bay are these super cute hair wraps, recycled boardshorts as well as poncho towels. These towels will hold a fair bit of water, but when they are drenched, they just will not hold any more! They are great to use to dry one person after getting out of the water, but after that they really need to dry completely before their next use. Thanks to the technology of the microfibre fabric, the Dock and Bay towels have a fast and efficient drying speed. They never smell bad either! Pretty amazing, we have owned these towels for ages and they hardly ever need washing! Even after they have been balled up at the bottom of a beach bag, our towels only need a bit of sun and air to bring them back to like new again. This is where Dock and Bay really performs as a major player. These fantastic quick dry towels which pack into a tiny pouch pack a punch when it comes to cost effectiveness. 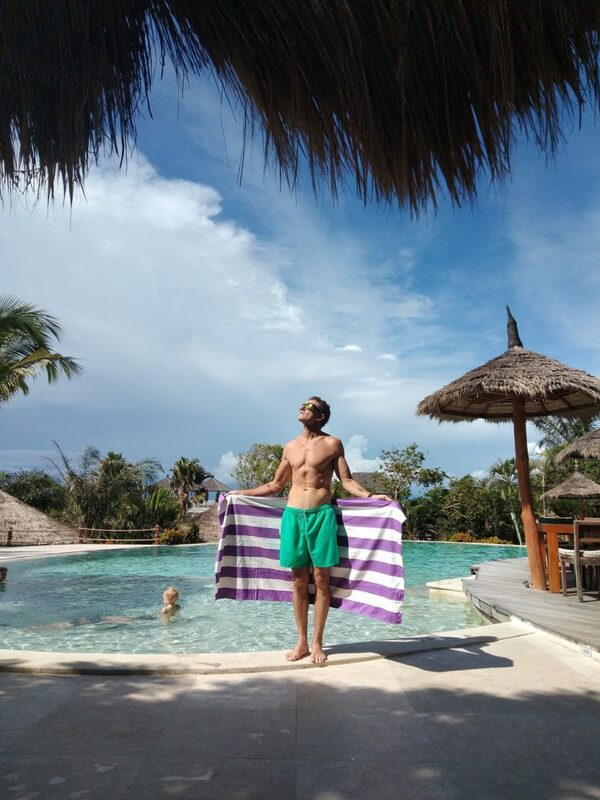 At only $20US for a small, and $25US for an extra large in the classic series, it is one of the cheapest lightweight travel towels we have found. Dock and Bay is striving towards a sustainable product with the new introduction of a range of boardshorts made out of 100% recycled plastic water bottles! The 2 founders of the company, Andy and Benno believe that together we can each take small steps to minimise our environmental impact and help create a better world for us all. With nearly 1,000,000 more plastic bottles sold around the world every minute (!) every little bit helps right?! 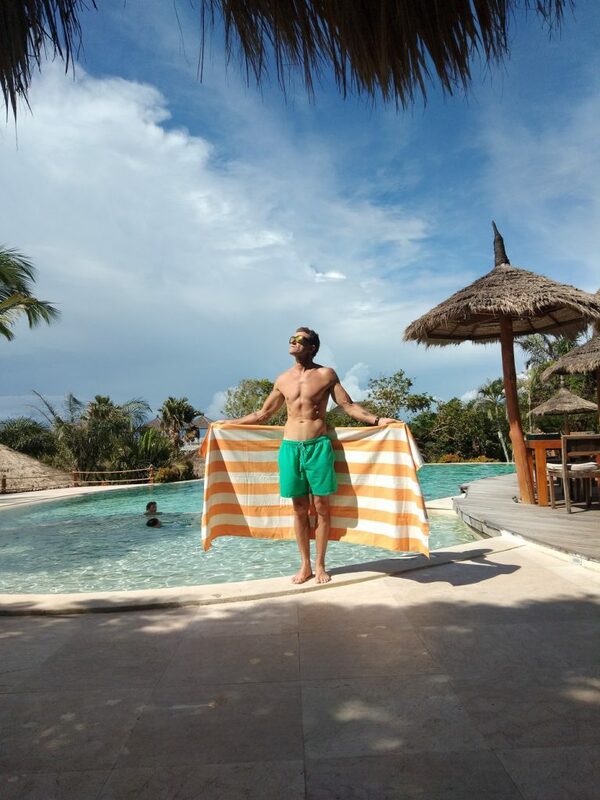 Dock and Bay towels tick all the boxes for compactness, cost, sand repellant and attractiveness that I look for in a travel towel. We love ours! 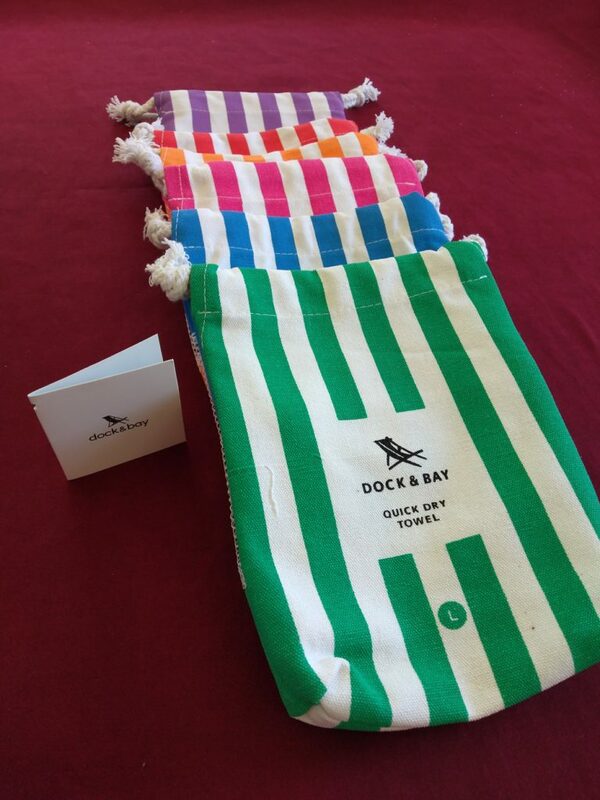 You can find Dock and Bay travel towels all over the internet. Click on this link to be taken directly to their sales page. If you are reading this, you should definitely be following us on Facebook or Instagram to get the latest updates on our year long trip around South East Asia with 4 children. We are still in Bali, but next stop is Thailand!! How did we end up here? Read this. You can visit the Dock and Bay website for more details. PIN ME!! SHARE THE LOVE OF THESE TOWELS!! !